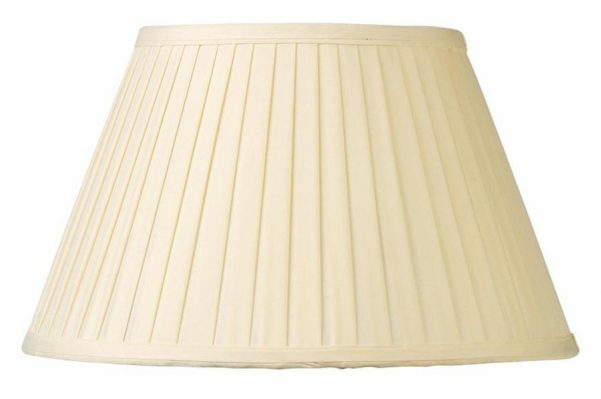 This cream knife pleated faux silk 45cm tapered table or floor lamp shade is beautifully lined in white fabric and is supplied with a reducer ring to fit ES (large Edison screw) and BC (large bayonet cap) lamp holders. A classic 18″ empire shade, knife pleated and fully lined, with matching ribbon finishing the top and bottom edging. A quality shade that will help give a new lease of life to your favourite large table lamp or floor standard lamp. Also available in 10, 12, 14, 16 and 20 inch diameter; please see below.